There’s a game I play with my friends. It is always spur of the moment and it always comes about when we have a disagreement, when neither my friend nor I want to get up and do something. It is initiated by one quick sentence: “Let’s go, on shoot.” That game is Rock Paper Scissors, but to us, it is more than a game. It’s a way of life. It is sacred and the loser must do what is expected of him, no questions asked. 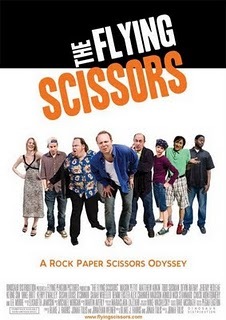 Perhaps that is why I was so amused by the new mockumentary, The Flying Scissors, a film that puts a humorous satirical spin on the hallowed game. The film follows the NRPSL (National Rock Paper Scissors League) as they prepare for the upcoming championship where dozens of regional winners from all over the nation will compete in upstate New York with the hope of being crowned the NRPSL champion. Among the contestants are Leon Washington, played by Mike Britt, who uses vulgar trash talk to intimidate his opponents, Frank, played by Todd Susman, an aging man who has come down with arthritis in his RPS hand, making it increasingly difficult to compete, and more zany kooks that spend a little too much time thinking about the seemingly arbitrary game of Rock Paper Scissors. Each contestant has their own way of preparing for the upcoming event. Leon records his swearing and plays it back to himself while others hire coaches and partake in training exercises that include crunching probability numbers, playing video games, doing cardio, and even wrestling alligators. How some of these translate to the game of Rock Paper Scissors I haven’t the slightest idea. Not that it matters anyway. The Flying Scissors isn’t trying to wow you through story or emotional involvement. It only hopes to provide a silly, stupid, fun time for all, and it succeeds for a while, though it is limited in its appeal. There are only so many times you can watch someone enthusiastically throw rock before it begins to get dull. Its biggest problems are that it doesn’t go anywhere unforeseen and it tends to drop certain side stories altogether. For example, the NRPSL’s rival is the Coin Toss Consortium, a coin flipping league, which is brought up only to serve as a very loose antithesis to the NRPSL, but it is quickly forgotten after a couple of brief scenes that don’t provide any extra depth to the film’s already flimsy story. Combine this with the unnecessary, misplaced political jab and the fact that we never truly come to know or care about any of these characters and you have a movie that wears out its welcome far too quickly. What The Flying Scissors does is take what would have been a hilarious short and stretches it to its breaking point. Nevertheless, it shows moments of inspiration, mocking the seriousness of big sporting events that in actuality hold just as little significance as a paltry Rock Paper Scissors match. In this regard, it is quite smart, but it never capitalizes on the satire and fails to say anything relevant about the sporting world. The Flying Scissors is a moderately amusing, if a bit sporadic, little picture that will work as a good watch on a rainy weekend, but like playing an actual game of Rock Paper Scissors, once is enough.